Black cats and Halloween, a purrrr-fect match! 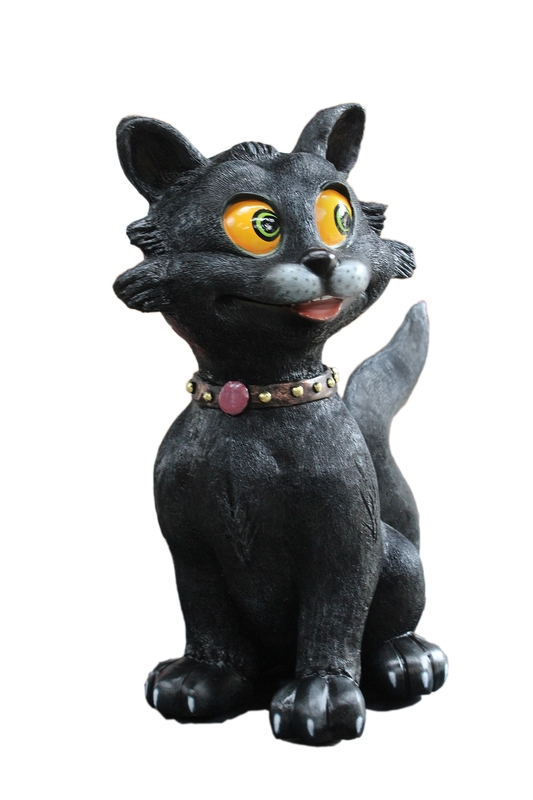 This lifelike cat stands 2' ft. tall and is detailed with animated and lovable features! A jet black coat of fur covers the surface of the statue, and is textured like real fur! It is sitting on its backside with a bushy 'S' curved tail extending. Around its neck is a chestnut colored collar with brass colored studs and a red, jewel shaped, tag on it. The cat is grinning, exposing friendly looking teeth and a white shaded muzzle. Big yellow eyes, with green pupils, look off-center at the passing scenes with eyes perked up. This adorable Black Cat isn't superstitious, just super-cute!